This Saturday, 16 April 2011, a special concert will be taking place at the Wigmore Hall in London. "The proud bassoon" is a memorial concert for William Waterhouse. William 'Bill' Waterhouse was appointed as a bassoon teacher at the Royal Manchester College of Music in 1966 and continued at the RNCM. 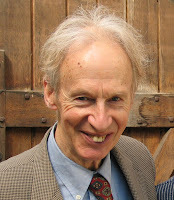 For a number of years Bill was involved in advising the College on its Collection of Historic Musical Instruments and became its Acting Honorary Curator. It is thanks to his endeavours that the Collection is displayed for visitors and, more particularly, that we have a complete catalogue of it. For more information about the Collection visit http://www.rncm.ac.uk/research-mainmenu-52/historic-instrument-collection-mainmenu-150.html. and for details of the catalogue http://www.rncm.ac.uk/component/content/article/150/318.html.